Serving as the frontline entrance into what is arguably America’s most famous Army base, the General George Patton Museum of Leadership has been undergoing a major facelift, including a renovation of the exhibit space, the addition of new interactive exhibits, and the integration of AV systems that not only perform the traditional tasks associated with a museum, but go beyond. Two Primacoustic Saturna hanging ceiling baffles are used to absorb audience noise and contribute to increased intelligibility in Abrams Auditorium at the General George Patton Museum of Leadership. For now, much of this has taken place in the facility’s Abrams Auditorium, an approximately 300-seat venue that is used to display biographical video presentations on the general himself for the benefit of museum visitors, as well as host special events, receive new cadets, hold movie nights for those on base, and conduct videoconferences both large and small. As Keith Stengl of the Louisville-based Axxis (doing business as ISSG), the AV firm charged with designing and integrating the new systems into the space, puts it: Abrams Auditorium has fast become one of the busiest rooms on base. The focal point of the space is a 21-foot wide, 16:9 Da-Lite screen, onto which images are projected by a Digital Projection dVision 1080p projector. 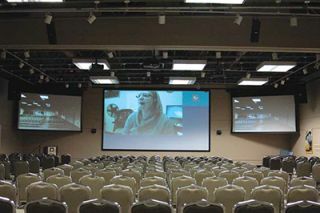 This central screen is flanked by two 11-foot-wide, 16:9 electric Da-Lite screens; projection is provided by Digital Projection mVision 1080p projectors. Four 50-inch video displays by LG hang on the rear wall. For videoconferencing applications, Axxis integrated BSS Soundweb London Audio Blu-102 processing, a Tandberg 6000 MXP codec, four Sony PTZ cameras, a Vaddio PTZ camera, and a combination of 12 lapel, headworn and handheld microphones by Sennheiser. Video is routed via an Extron fiber optic switcher and distributed over Extron fiber sender/receivers. The surround sound system features Bose processing and a combination of Bose Panarray LT-9403 and LT-9400 speakers, 402II fill speakers and dual MB24 subs, supported by Crown amplification. For meetings and presentations, the sound is converted to stereo audio. An AMX NI 4100 processor offers full control, including for the cameras, audio/video routing, power and source selection, through two AMX NXT-1200 touch panels. Stengl relays that the biggest challenge associated with this project was providing the flexibility that the museum’s leadership was asking for. “They wanted the room to do so many different things,” he said. “The challenge was to create a touch panel for the AMX control system that was simplified enough and still have all of these capabilities.” For the wireless mic control, for example, Axxis designed an actual on-screen visual of a mixer. Early on, acoustics were an issue—especially when the space was filled with people. “This was a particularly excitable room that resulted in voices reverberating so aggressively that it overshadowed the sound system,” explained Steve Dickson, business development at acoustical solutions provider Primacoustic. “And with the energy congregating high in the room it made sense to address the ceiling area, especially since the museum did not want any treatment on the walls.” To address this, two Primacoustic Saturna hanging ceiling baffles are used to absorb audience noise and contribute to increased intelligibility.